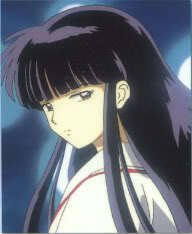 Bio: Kikyo was a powerful shrine maiden, or priestess, who was given the task of guarding the Shikon Jewel. She falls in love with Inuyasha and considers using the jewel to turn him from a half-demon into a full human; this would cause the Shikon Jewel to vanish, allowing her to live as an ordinary woman by his side. However, Naraku disguises himself as Inuyasha to attack her village, mortally wounding her. With her last strength, Kikyo shoots a charmed arrow into the real InuYasha to seal him to a sacred tree, then orders the Shikon Jewel to be burned with her on her funeral pyre. The jewel disappears and is apparently destroyed, but is reborn 500 years later in the body of Kagome Higurashi, her spiritual reincarnation. After Kagome travels back through time and reappears fifty years after Kikyo's death, an ogress tries to pull her reincarnated soul into a clay body made with Kikyo's bones and ashes. Kagome appears to suffer no permanent harm, but a small part of her soul detaches and reanimates the new body with Kikyo's memories, personality, and human appearance. Although Kikyo retains some of her old powers in this form, she remains technically "dead" and must absorb the souls of dead women in order to move. At first, she wants to vengefully drag InuYasha to hell and kill Kagome to recover the rest of her soul. However, Kikyo gradually returns to her former compassionate nature and learns the real circumstances of her death. She protects Kohaku, saving his life. Kikyo dies peacefully in InuYasha's arms after being attacked by Naraku.